In social change organisations we want to change things. Real world things. Things that make a difference to people. If changing the numbers in our website statistics can contribute towards that, then we want to change those numbers. But it can be far to easy (doubly so, it seems, when reports for funders are involved) to get trapped looking at the numbers, and to lose sight of how those are part of creating change for people. I recently had the chance to put together a training pack/guide for Participation Works about web analytics, and how they can be used in a social change focussed organisation. Much of the guide was specific to Participation Works, but a lot is, I hope, relevant to other social change organisations as well. And as I must acknowledge much debt to shared content from Beth Kanter and many others in putting together this guide, it only seems right to share what I can of it back freely to non-profit organisations. 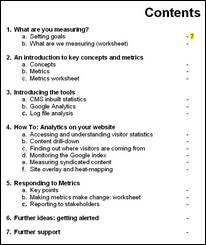 This is a skeleton document for building a guide to web analytics for social change organisations. It is shared under a creative commons non commercial license in the interests of supporting those working with not for profit organisations. If you wish to use or adapt this guide as part of paid consultancy to not-for-profit organisations, or in private sector settings, please contact tim@practicalparticipation.co.uk in advance. This guide is not out-of-the-box ready to be used. 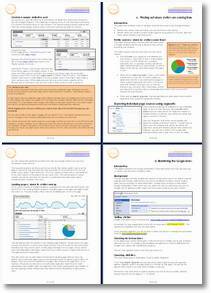 Throughout this document you will find text highlighted in yellow which will need customizing for the particular context where use of this guide is intended. This customization will require some technical knowledge. Other areas of the document not highlighted in yellow may also need to be changed depending on your context. That said, most of Chapters 1, 2 and 4 can be taken and used fairly as-is.